Places to see in Chungbung: Chungbung is dotted with tourist attractions. Durpiney Dara meaning the telescopic hill is one of the main attractions here. You can savor an amazing telescopic view of the surrounding place from the Durpiney dara. Locally, the place is also called “gadi,” which means fort. Long back, there was a fort in the region. Even now, you can see the ruins of that old fort, which has lately, became the take-off spot for paragliders. 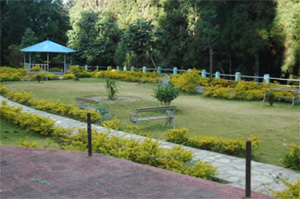 The Tanki Dara nestled amidst trees is one of the most preferred picnic spots located just above the Chungbung village. The place is a heaven for the avid bird watchers. The place is also known as Hinguwa Tar, which means a tree similar to a tea-shrub. Chungbung is dotted with such shrubs throughout the region. The inhabitants of Chungbung are religious in nature. They worship “Nag Dewta,” a deity in the form of snake at the nearby spot of Nag Dhunga. They have shaped a huge stone like a snake. The place is also called ‘Alley’. Yesoltsoling Monastery is a nearby ancient and holy Buddhist monastery. 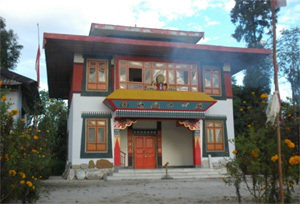 The Noobling Gumpa is another holy monastery near Chugbung, which is said to be the haven of the Tantrik Lamas’ in the olden times. The house of the first Chief-Minister of democratic Sikkim, L.D. Kazi, is also near Chungbung. The house was built out of mud in the traditional architectural style and it is endowed with a special feature. The interior of the house cools down naturally in summer and heats up naturally during the winter. Things to do in Chungbung: Try out paragliding, a major attraction of the tourists visiting Chungbung. 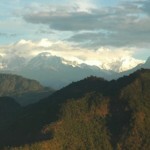 The upcoming International Paragliding Festival 2011 will also be hosted at Chungbung. 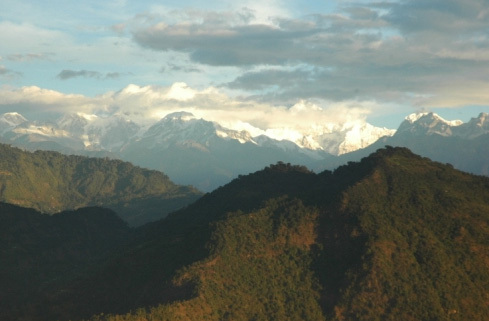 Chungbung faces the white snow capped mountains and the beautiful view of the tea-estate sprawling on the other side in the Darjeeling district in the West Bengal state. Paragliding lovers could head straight to Durpiney Dara for the take-off. Chungbung is well developed for a long distance paragliding up to Jorethang, covering an aerial distance of 6 kilometers. How to reach Chungbung: The nearest railhead of the region is located at New Jalpaiguri and the closest airport is Bagdogra. Hired cars are available at the railway station and airport, carrying visitors to Chungbung. The entry point to Chungbung is through Jorethang, which is around 13 kms away. Best time to visit Chungbung: You can visit Chungbung any time of the year but paragliding can be enjoyed mostly during winters only. Lodging and dining facilities in Chungbung: There are some excellent home stay facilities available in Chungbung for lodging and dining.